Celebrate the arrival of a beautiful baby boy with a generously filled deluxe fabric lined hamper. It overflows with a collection of select baby necessities any new parent will love. 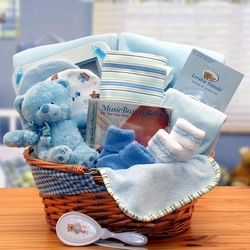 The fabric lined basket makes for great storage in babies room after the gift is used.